In Texas we’ve been complaining about the heat for months. It’s been a long summer and my kitchen has gotten a big break – I’ve just not felt like cooking (my absence explained). But when my friend Laura brought over this salad a few weeks ago it was decidedly the thing I was going to make and could enjoy eating in 107 degrees. My inspiration will return in the Fall – already have lots of new things I can’t wait to share. 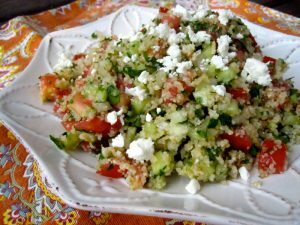 This recipe is based on the traditional tabouleh salad, a popular Middle Eastern side dish containing vegetables, olive oil and spices. There are a few differences – the use of lime and much less parsley, which I prefer. The base of bulgur wheat and the vegetables makes it super nutritious and a perfect summer side. I like to add grilled chicken or shrimp and make it a meal – but it’s a perfect side dish for my Greek Chicken Meatballs with Spicy Yogurt Sauce. Bulgur wheat is a natural whole grain food that is quick cooking and very nutritious. It’s high in fiber, rich in B vitamins and has fewer calories, less fat, 4 times the folate and more than twice the fiber of brown rice. It’s nutty flavor is perfect in this Mediterranean inspired salad. Refrigerate for 2 hours then remove and add 1/2 cup olive oil. Stir to combine. Add tomatoes and feta and mix all together. Serve as a side dish or make it a meal by adding grilled chicken or shrimp. Oh i have missed Yvonne recipes. This one looks great.